Colm O’Donnellan said: “This auction has an incredible selection of attractively priced property for both investors and home owners with commercial and residential properties listed for sale throughout the Atlantic seaboard.” Tomorrow’s auction has property for sale in Donegal, Mayo, Sligo, Roscommon, Galway, Clare, Limerick, and Leitrim. Strong local, national, and international interest has been expressed with a particularly strong interest in property around Galway city. O’Donnellan & Joyce has a large selection of properties for sale, with something to interest all purchasers. Some of the properties available in the auction include the following. Located at the start of Carragh Drive and overlooking Knocknacarra Road, the property offers approximately 220sq m of space with views towards Galway Bay. Presented in good condition, it has a substantial sized reception and kitchen areas, along with a study room, five bedrooms, one en suite, family bathroom, separate utility room, and guest wc. Externally, No 1 Carragh Drive avails of ample off-street parking, an elevated garden space at the rear and manicured flower beds throughout the premises. AMV: €575,000. Wonderful five bed semidetached residence ideally located in the popular and sought after residential area of Whitestrand Park. This property would be an excellent owner occupier residence or gilt edged investment due to its exceptional location and ease of access to a host of amenities and services. AMV: €350,000. Incredible opportunity to acquire a property situated on the ‘golden mile’ in Salthill. This fine end of terrace house is full of character and charm and would be a delightful home. The location is second to none. Salthill is one of the most sought after residential locations in Galway, offering an abundance of amenities and services on your doorstep. AMV: €275,000. This is an outstanding two bed apartment, located within walking distance of Eyre Square. The property is just off College Road, a short stroll from Galway’s bus and rail stations. This is a modern residential development and No 32 The Elms would ideally suit as a first time buyer’s home, a holiday home, or somewhere to downsize to. AMV: €210,000. Large four bed detached house centrally located on approximately 7.29 acres of land. The property is in need of complete renovation and refurbishment with accommodation comprising entrance hall, living room, sitting room, kitchen, utility, four bedrooms, and a family bathroom. AMV: €175,000. A magnificent opportunity to acquire a large four bedroom semidetached residence extending to 116sq m (1,249sq ft ) at Lissadyra, Ballygaddy Road, Tuam, Co Galway. This home offers a spacious interior in mint condition throughout and would be the ultimate family home. Located in a traffic free cul-de-sac, this much sought after and central residential development is located within walking distance of Tuam town centre. AMV: €135,000. 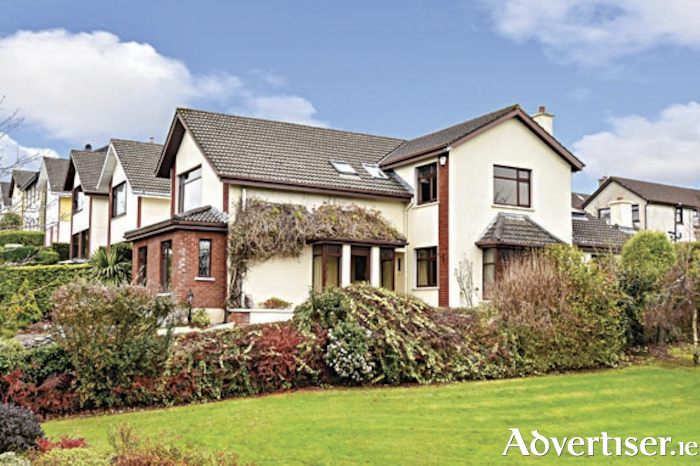 Four bed semidetached residence located on the east side of Galway city in Renmore. Gleann Rua is a superb location offering exceptional convenience for modern day living. The property is within walking distance of GMIT, Merlin Park Hospital, Ballyloughane Beach, and a wide selection of shops located at the Wellpark and Briarhill shopping centres. AMV: €260,000. Located on the main Barna road, adjacent to the junction with Cappagh Road, this site comprises approximately 0.53 hectare (1.3 acres ) on Folio GY38718. Local amenities include Rusheen Bay water sports, Silverstrand beach, Galway Golf Club, and Salthill village, beach, and promenade. This is a very popular and well established residential area. AMV: €65,000. Three bed semidetached residence located just off the N17 on the edge of Tuam town centre. Located close to all amenities in Tuam town centre and with easy access to the M17/M18 motorway with connections to Galway city, Limerick, and Sligo. Being sold with vacant possession and would make an ideal starter home or an investment due to the rental potential in Tuam. AMV: €110,000. Three bed second floor apartment located in the popular and sought after development of Gort na Coiribe on the Headford Road, Galway. The estate comprises a mixture of homes in two residential areas, known as Gort na Coiribe and Dun na Coiribe. Gort na Coiribe is located to the front of the estate and comprises a mixture of two and three bedroom apartments. AMV: €220,000. Three bed mid-terrace residence located in the popular area of Oranhill. Oranhill is situated on the edge of Oranmore village where all amenities and services are available. This is a popular location for both owner occupiers and investors, only 10km from Galway city and within easy access of the M17/M18 motorway. The property is being sold with vacant possession and requires some upgrading. AMV: €170,000. Three bedroom townhouse located just off College Road near the Huntsman Restaurant. The property comprises living/dining room, galley style kitchen, three bedrooms, and bathroom. The property is currently rented and is generating a rental income of €700 per month. The property is being sold with tenants in place who have been in situ in excess of five years. AMV: €180,000. Three bedroom duplex apartment situated over a ground floor commercial unit within the Millbrook estate. The property features an open plan kitchen/diner, and a downstairs toilet. The first floor has a bathroom and three bedrooms. Located within 10 minutes of Tuam town with convenient access to the M17 with connections to Galway, Limerick, and Dublin. AMV: €60,000. Three bedroom mid-terrace residence conveniently located close to Galway city centre. Accommodation comprises entrance hall, downstairs toilet, kitchen/dining room, living room, three bedrooms (one en suite ), and bathroom. The property is being sold with vacant possession. The property is presented in good condition and would be an ideal investment or starter home. AMV: €185,000. Two bed townhouse located close to the centre of Salthill. This is an attractive development located in a quiet area off the main Salthill strip. The property contains its own entrance along with private communal parking. This is an attractive development in an excellent location and idea for anyone looking to live just moments from Salthill Promenade. AMV: €235,000. Four bedroomed semidetached residence located in the centre of Clifden town. The property is situated within a mature development on Racecourse Hill and within walking distance of all amenities in Clifden. AMV: €125,000. One bedroom unit located on the grounds of Portumna Retirement Village. The property is currently leased to Portumna Retirement Village on a 15 year lease until approximately 2023. The rent generally obtained for one bed units is in the region of €330 to €380 per month. The unit is currently vacant and rent is only payable to a landlord for the periods it is occupied. AMV: €50,000. Are you thinking of selling in 2019? Auction dates include March 1, April 18, June 7, July 19, September 27, November 8, and December 13. For further information on these or any of the properties for sale contact O’Donnellan & Joyce auctioneers, 5 Mary Street, Galway, on 091 564 212, www.odonnjoyce.com, or email [email protected] .